Making use of vacant space in Puigcerda, Spain! Forty-four years ago, Earth Day began as a reponse to increasing discontent over the state of the environment and a call to action for policy makers and the general public alike. April 22nd is a reminder of this year in and year out. Now, a lot has happened in those intervening decades, but one thing is for sure - we have a long way to go still. And the world continues to see more and more people moving into cities, as well. Now this isn't necessarily a bad thing - we can be more efficient with space and movement of goods and services; we can capitalize on walkability and bikeability; and we can cultivate centres of cultural and geographic diversity in vibrant metropolises. But at the same time, urbanites are decidedly removed from what many consider "nature", not to mention regular reminders of all of the steps along supply chains to get Natural Resource A to the corner shop as Packaged Good B. While many people flock to cities because of job opportunities (guilty) or the exciting arts, theatre, cuisine, etc. (guilty again), urban areas are still hotbeds of poverty and food insecurity. Though it is widely accepted that more poor people live out rural areas, one could argue (and some have!) that urban poor face greater challenges living in slums, without the ability of self-provision (e.g. through a home garden), and with greater reliance on governance and public support to eke out a living. Whoah, what a downer. Why am I even talking about all these issues, together? Well, as mentioned, yesterday was the 44nd observance of Earth Day - this year with the theme of 'Green Cities'. With the Live Below the Line challenge looming not five days away, poverty and hunger are even more on my mind (though that dratted essay should be...). There's an awful lot of talk about reducing poverty and ensuring food security in urban settings, but the environmental footprint, and one could argue the right to a sustainably-produced diet, often gets brushed aside in these conversations in deference to development. Considering the constraints of people in cities - in terms of access to land or time for activities outside of the factory job - it is hard to see how we can also grow a healthier, better fed, and more sustainable urban population. 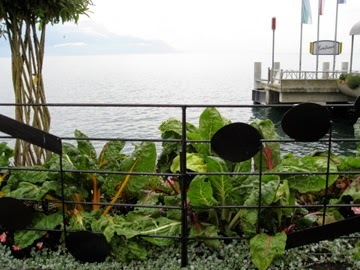 Swiss chard in Montreax? Yes, please. OK, doom and gloom, let's hear something uplifting! So in response to Earth Day being all about greening cities, there was a bit of a stir over what is actually happening in terms of urban agriculture and food security. Food Tank, of course, provided one of its classic lists of movers and shakers, noting that "there are at least one billion urban farmers and gardeners around the world, providing food and nutrition to poor and wealthy consumers alike." For example, the Resource Centres on Urban Agriculture and Food Security (RUAF Foundation) tackles the urban food system, so that it's not just about a small plot of land but a transformation of underlying structures - from rooftop gardens as part of Kathmandu's building codes to the creation of an Urban Agriculture Bureau in Amman. More recently even, groups are reimagining how urban and rural can work together for both food secure and green (in more ways than one) cities (Yeah, EcoAg!). In terms of my own experience, helping out with youth education at Common Good City Farm in DC a few years back was a bit of an eye-opener. This piece of old baseball diamond turned community garden is still providing fresh veg and community gathering space to a well-established (and on the lower end of the income spectrum) neighborhood!